In its basic definition, a “spec script” is a screenplay written on “speculation” (that someone out there will want it). In other words, a script written out of the volition of its writer—without any kind of deal or monetary compensation in place. Although similarly uncompensated, a spec script in television specifically refers to a “sample episode“. 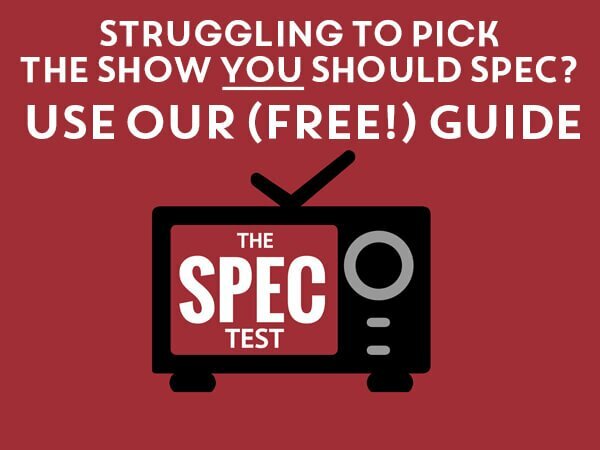 The goal of the TV spec script is to showcase your writing abilities. b) you can write within the Mad Men parameters, i.e. mimic an episode of the show. That means that you need to write with the same format/structure as the show (e.g. four acts), and also be able to channel the showrunner’s (Matthew Weiner’s) “voice”. In recent years, spec pilots have overtaken spec scripts in terms of what executives and showrunners want to read for new hires. That doesn’t mean you shouldn’t write sample episode spec scripts! Even outside of the TV writing fellowships, they are amazing exercises. In fact, your TV writing career will primarily be about your ability to write for a showrunner. Spec pilots are a sub-division of spec scripts. Much like their counterparts, they are written unsolicited. They are here, once again, to show that you can write. This time though, with you own original well-executed ideas. Note that spec pilots should not be written in the hopes of getting produced. There’s only been a handful of spec pilots being made. One of those famously being Matthew Weiner’s Mad Men. He was already established as a TV writer when he AMC bought it. He had used his Mad Men spec pilot as a writing sample to get on The Sopranos. And now others spec his show. The circle is complete. What are you thoughts on spec pilots that are spin-offs of currently airing shows? Are you talking about creating your own “original” spec pilot as a spin-off of an existing show? If it’s something you’re itching to write, then go for it. But understand that such a script will always be considered a “stunt spec”. – It’s a risky sample that could be worthwile if you land it in front of the right person at the right time. – It could be seen as an amateurish move. Especially if you don’t have a bunch of other original samples to back up your portfolio. At the end of the day, your readership appeal is limited to fans of the original show(s). I actually tried my luck once with an original pilot spec for a new Star Trek series. That was because I really needed to write one, regardless of what I could or could not do with such a script. Long story short, I’d say that as long as it’s not your only original sample, then have fun with it, but don’t expect anything out of it.